Holography is a process that creates three-dimensional images called holograms using laser beams, the properties of interference and diffraction, light intensity recording, and illumination of the recording.1 The images change according to the relative position of the individual viewer as if the objects displayed are actually present. This addition of motion represents a significant advancement to current 3D displays, which can only show 3D static images. 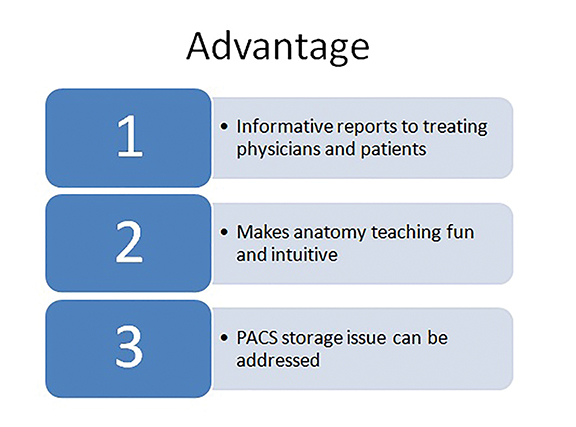 It also opens the door to three major potential uses of holography in radiology: teaching anatomy, PACS storage, and displaying more complex anatomic images that can be used to present more informative reports to treating physicians and their patients (Figure 1). This article explores these potential uses of holography in radiology. The term “holography” was first coined by Dennis Gabor, who discovered the process accidentally while performing research into improving electron microscopes in 1948; Gabor subsequently was honored with the Nobel Prize for this work.3,4 In 1962, the development of lasers led to holograms that recorded 3D objects. Until recently, holographic display technology only allowed for the display of static objects, but research into this field has led to the development of holographic volumetric displays, which can render dynamic images at two frames per second.5 Improvements in this technology can lead to applications in medicine. Current digital holograms can allow us to see objects in three dimensions without using 3D glasses, as they are auto stereoscopic. Digital holography is a two-step process. Step one involves recording the hologram where the radiographic image is transformed into a photographic record. Step two consists of reconstruction, in which the hologram is transformed into a virtual image. This process occurs due to interference between two waves. A hologram can be made by shining one part of the light beam directly onto the recording medium, and the other part onto the object in such a way that some of the scattered light falls onto the recording medium. When the two laser beams reach the recording medium, their light waves intersect and interfere with each other. It is this interference pattern that is imprinted (Figure 2). The digital hologram created contains a grid of holographic pixels, also known as holopixels or the aforementioned hogels. Holopixels are diminishing in scale, currently around 0.8 mm and now reducing to 0.5 mm or even 0.25 mm. Any type of 3D medical dataset, such as CT and MR images, can be converted to a digital hologram. As noted previously, there are three potential uses of holography in radiology: teaching radiologic anatomy, as a potential candidate for PACS storage and for image display. We will now explore these uses in greater detail. 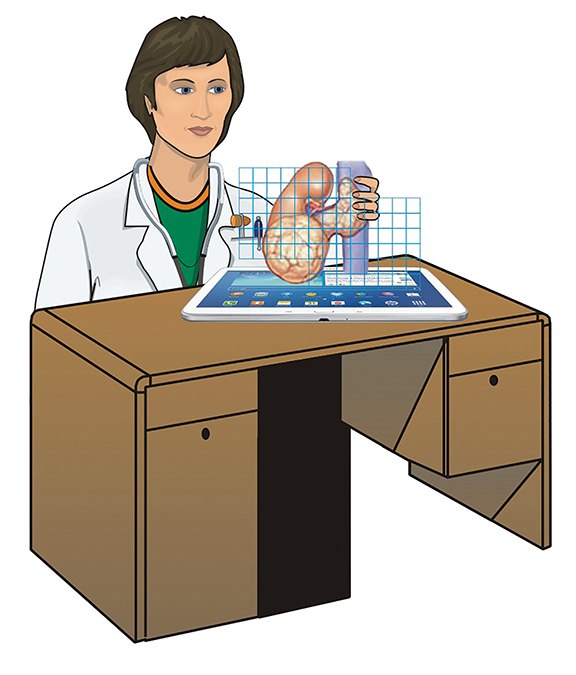 The medical hologram, particularly in radiology, presents a performance boost over traditional textbook images. It brings in the “charm and has the potential to generate curiosity.”10 This can be achieved by using static holographic images of anatomical structures in textbooks, which can then easily display the relation of body structures with respect to each other in three dimensions. Holoxica worked with the Clinical Research Imaging Centre (CRIC) at Edinburgh University on a full-color digital hologram of a pair of lungs from a CT scan.8 This technique enabled the intricate detail of the anatomical structures to be visualized. It has also been documented to be used to image the liver from ultrasound scans. Complex holograms containing information layers from images of the musculoskeletal system, vascular and nervous system are now possible. Current radiology study image sizes vary from 10 megabytes (MB) to 90 MB in size per test. By adopting PACS, there has been a turnaround in radiology productivity by channeling radiology workflow.13 Holographic media can be used specifically for data storage due to their unique ability to store information in three dimensions, in contrast to standard optical disks, which manage to store data only on the surface. In the near future there is a high probability that this technology can eventually replace magnetic, single-layer storage by optical, 3-dimensional holograms.14 Radiology units depend on PACS to achieve their goals of high-speed access to images, steadfastness and efficacy. Comparative data suggests that the cost for the new holographic media will probably be somewhere in the neighborhood of $0.06-$0.20 per gigabyte (GB) compared to data tape, which costs between $0.25 and $1, and videotape which costs between $1 and $3 per GB.14 Significant research over hard disk drives has presently taken the cost to an average of about $0.2 per GB, however, further reduction in cost is likely going to require newer technologies. Holographic storage is one of the most promising solutions in this regard. The use of holographic displays in radiology is still in research, but they can soon find their way into commercial use and become economically viable.23 A holographic screen can be created using a specially coated glass media for the projection surface of a video projector, therefore creating a free-space display, as the image bearer appears very transparent. In addition, by controlling the beam with special lenses, the image can be made to appear to be floating in front of or behind the glass, rather than directly on it. These views can be particularly advantageous in radiology, as computers will send the 3D CT data to a projector, which will beam it to a computer screen. 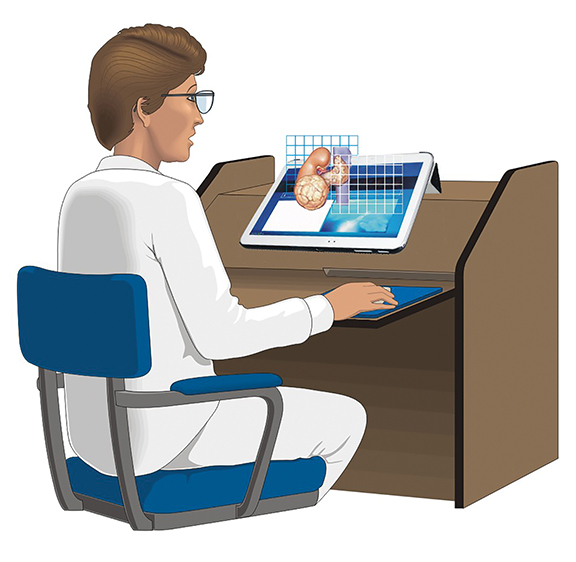 The radiologist, by touching the screen, will create a series of electrical impulses which will be sent to the computer. The computer will interpret the signal and modulate the projected image according to the information, thereby eliminating the use of the mouse. Furthermore, 3D reconstruction of 2D images from sectional imaging can lead to detailed 3D models of body structures, which can then be holographically displayed. This approach may be especially useful to surgeons, who are not used to viewing the body in sectional images, thus helping them in planning different approaches to, and guiding interventions during, surgery. The current limitations of holography are fairly significant. Holography requires relatively complicated methods to record holographic images, making them costly and less accessible. Further, displaying holographic images requires elaborate machinery. Currently, holographic display technology lies far behind commercially available 2D and 3D displays. The most advanced volumetric displays currently have very poor spatial resolution, and can display images at only about two frames per second. Significant research is required to improve these displays to make them truly useful to the practicing doctor rather than the novel technological preview which they are currently. Holographic images are also inherently poor at visualizing subtle tissue contrast differences. They are thus more useful at showing areas of interest to people unfamiliar with radiological sectional images than for actual radiological diagnosis. Holography has the potential to transform radiology and make it truly virtual. It can provide radiologists with the freedom to take radiology workflow beyond the high-resolution monitors into free space. It can also potentially help radiologists abandon the usual 2D workflow of a conventional monitor and mouse to process the images, thereby changing the ergonomics of radiology practice. Radiology reports can become more informative as the associations between complex lesions and adjacent vessels can be studied in their true dimensions. Holography can help address the complex issue of image storage and retrieval. As imaging databases increase, the available electronic storage within hospitals will be more rapidly depleted, requiring significant costs to maintain adequate memory capacity. Holographic storage media can provide a cost-efficient bridge to maintain vast amounts of information until the next major leap in memory technology. Tung H. Jeong. Basic principles and applications of holography. Lake Forest College, Lake Forest Illinois. https://spie.org/Documents/Publications/00%20STEP%20Module%2010.pdf. Accessed Nov. 30, 2016. Hunziker P, Smith S, Scherrer-Crosbie M, et al. Dynamic holographic imaging of the beating human heart. Circulation. 1999(5); 99:1-6. The Nobel Prize in physics 1971. Available from: http://www.nobelprize.org/nobel_prizes/physics/laureates/1971. Accessed Nov. 30, 2016. Gabor D. A new microscopic principle. Nature. 1948; 161(4098): 777-778. Blanche PA, Bablumian A, Voorakaranam R, et al. Holographic three-dimensional telepresence using large-area photorefractive polymer. Nature. 2010; 468: 80–83(letter). Hariharan. In: Hariharan P, ed. Optical holography: principles, techniques, and applications. 2nd ed. New York: Cambridge University Press; 1996:4-5. Plesniak W, Pappu R, Underkoffler J, et al. In: Benton SA, Bove VM, eds. Holographic Imaging. 1st ed. Hoboken, New Jersey: Wiley-Interscience; 2008: 207-229. 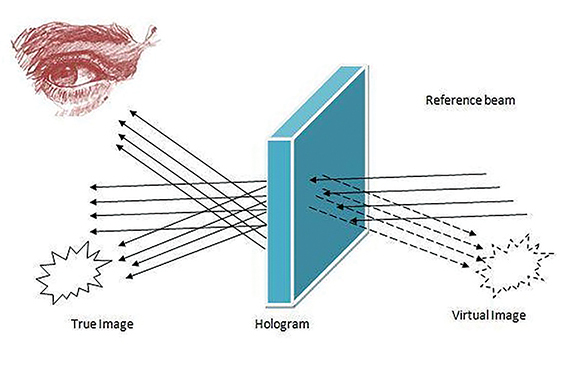 Khan J. Biomedical imaging: 3D digital holograms visualize biomedical applications (2013). Available from: http://www.laserfocusworld.com/articles/print/volume-49/issue-07/features/biomedical-imaging-3d-digital-holograms-visualize-biomedical-applications.html. Accessed Nov. 29, 2016. Bjelkhagen HI, Brotherton-Ratcliff D. Ultra-realistic imaging: advanced techniques in analogue and digital color holography. Taylor & Francis Group, London. England. 2013. Hackett M. Medical holography for basic anatomy training. Interservice/Industry Training, Simulation, and Education Conference (I/ITSEC) 2013. Paper No. 13207. Buhmann JM, Malik J, Perona P. Image recognition: Visual grouping, recognition, and learning. Proc Natl Acad Sci. 1999; 96(25): 14203-14204. John E. Holographic technology for PACS storage: An emerging technology. Available from: http://www.eradimaging.com/site/article.cfm?ID=339#.U8yVFNyZ3oB. Accessed Nov. 29. 2016. Lepanto L, Para G, Aubry D, et al. Impact of PACS on dictation turnaround time and productivity. J Digit Imaging. 2006;19(1):92-97. Colang J, Johnston J. PACS storage technology update: holographic storage. Radiol Manage. 2006;28(3):38-46. InPhase Technologies. What is holographic storage? 2005. Available from: http://www.inphase-technologies.com/technology/default.asp?subn=2_1. Accessed Oct. 1, 2014. Nagy P, Farmer J. Demystifying data storage: archiving options for PACS. Appl Radiol. 2004; 33(5):18-22. Smith E. What’s in storage? ADVANCE Imaging Oncol Adm. 2004:27-30. Frejlich J, de Oliveira I, Arizmendi L, et al. Fixed holograms in iron-doped lithium niobate: simultaneous self-stabilized recording and compensation. Appl Opt. 2007; 46(2):227-233. Holographic Data Storage Technology. IBM Journal of Research and Development. 2000:44(3). doi:10.1147/rd.443.0341. Liu Y, Kitamura K, Ravi G, et al. Growth and two-color holographic storage properties in Mn-doped lithium niobate crystals with carrying Li/Nb ratio. J Appl Phys. 2004; 96(11):5996-6001. Konkachbaev AI, Elmaghraby AS. Interface for digital medical image databases. 4th International IEEE EMBS Special Topic Conference on Information Technology Applications in Biomedicine 2003. Piscataway, NJ: Computer Society Press. ; 2003:238-241. Service R. Putting the infrared heat on X-rays. Science. 1998; 279(5347):33. Bove VM. Display holography’s digital second act. Proc. IEEE. 2012; 100 (4): 918–928. Pinto FJ, Veiga F, Lopes MG, et al. Dynamic three-dimensional echocardiography: a new era in ultrasound technology. Rev Port Cardiol. 1997;16(10):787–795; 745–746. Galeotti JM, Siegel M, Stetten G. Real-time tomographic holography for augmented reality. Opt Lett. 2010;35(14):2352–2354. Robertson DD, Sutherland CJ, Chan BW, et al. Depiction of pelvic fractures using 3D volumetric holography: comparison of plain X-ray and CT. J Comput Assist Tomogr. 1995;19(6):967–974. Del Socorro Hernández-Montes M, Furlong C, Rosowski JJ, et al. Optoelectronic holographic otoscope for measurement of nano-displacements in tympanic membranes. J Biomed Opt. 2009;14(3):034023. Biwasaka H, Saigusa K, Aoki Y. The applicability of holography in forensic identification: a fusion of the traditional optical technique and digital technique. J Forensic Sci. 2005;50(2):393–399. Live 3D holographic imaging for use in interventional cardiology assessed. Available from: http://www.medimaging.net/radiography/articles/294748950/live_3d_holographic_imaging_for_use_in_interventional_cardiology_assessed.html. Accessed Nov. 30, 2016. Future of computing (optical & biological possibilities). Available from: http://www.doc.ic.ac.uk/~nd/surprise_97/journal/vol1/ary/#problems. Accessed Nov. 29, 2016. Kharat AT, Kalra R, Shah A, Singh A. Exploring the potential use of holographic imaging in radiology. Appl Radiol. 2016;45(12):19-22. Dr. Kharat, Dr. Kalra, Dr. Shah, and Dr. Singh are Radiologists in the Department of Radiology at Dr. D Y Patil Medical College, Maharashtra, India.